Ten-year-old Mario must flee El Salvador during the Salvadoran Civil War in the 1980s with Mama and little brother Nico after his journalist father is killed. As Mario struggles to adapt to his new life in the United States, he must also come to terms with the decisions his father made that have left him fatherless and illegal in a new country. Will Mario get deported after he gets caught stealing candy for Nico? Will mean-boy Randall report him to the police? – Kirkus Reviews Click here to read the review. 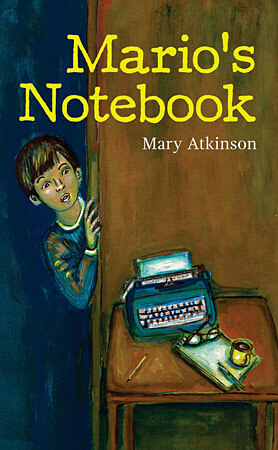 “Mary Atkinson gives voice to the voiceless in her excellent novel Mario’s Notebook. There were many atrocities in El Salvador during the civil war. Mario’s story is one of them. This book is a testimony and resistance for all those children who are living in the middle of a war. Mario’s story needs to be heard and read.” René Colato Lainez, Salvadoran children’s author of Telegrams to Heaven and My Shoes and I.
I was inspired to write Mario’s Notebook in the late 1970s when I was a young Spanish bilingual elementary school teacher living in Cincinnati, Ohio. During that time I also hosted a Spanish radio program on community radio station WAIF. Many people from the Hispanic community in Cincinnati, including several families from El Salvador, tuned into and were guests on my weekly program, Arroz con Leche. Through them, I learned about the Salvadoran Civil War and their experiences coming to the U.S. I wondered what it must be like for children to leave behind family and friends during the war. Though Mario’s story began churning in my imagination way back then, it took many, many years to write. But I stuck with it because the deeper I got into my research and the meanderings of my imagination, the more I needed to tell Mario’s story. Years passed. Later, with my MFA in Writing for Children and Young Adults from Vermont College in hand, I was ready to submit to publishers. While several editors expressed interest and guided me in some revisions, in the end, they decided not to publish MARIO’S NOTEBOOK. I put the manuscript away and tried to forget about it as I worked on other projects like OWL GIRL and TILLIE HEART AND SOUL. With all that’s happening in our world today, I believe that Mario’s story as a child who has to leave his country because of war and become a refugee in the U.S. where he isn’t always welcomed by everyone, is an important one that, unfortunately, many such children and their caregivers will relate to. The Twitter hashtag #OwnVoices and what it represents are gradually gaining momentum in the children’s publishing world of 2017. #OwnVoices indicates that a book was written by a member of the marginalized community it depicts. I wholeheartedly agree with and support the #OwnVoices movement. I believe that publishers’ first choice in regard to books about diverse communities should be to acquire books by authors from those communities. But while we’re waiting for this to happen, children from and children interested in learning about those communities need to find books about diverse populations in their classrooms and libraries. My first wish is that Señor Perez would turn off the opera on the car radio. My second wish is that he’d stop smoking his cigar. It’s disgusting the way he chews on it and rolls it from one side of his mouth to the other. I can’t breathe and it smells like horse manure in here. My third wish is that my little brother Nico would stop bouncing around on the back seat and we could get out of this stupid car and walk home from school like we used to. Ya lo sé. I know. My country is at war. Mamá has told me a million times that she feels better if we ride with our gardener instead of walking. Especially since Archbishop Romero was killed just three days ago. Of course my real wish is to stop the war. If I had super powers, that’s what I’d do. But I’m only a ten-year-old kid, and I’m stuck in this smoky car right now with the windows closed and some lady is singing on the radio like she’s got a cat in her throat and it’s scratching my ears out! “Hurry up, get out of the street,” Señor Perez grumbles to the people outside our air-conditioned car. He’s pressing on the horn, honking at cars and people to get out of the way. “Move along, imbécil!” he calls. If Mamá could hear the way he swears, maybe then she’d think twice about asking him to drive us home from school. A broken-down bus blocks the intersection in a plaza not far from our house. Three men are hanging out the windows, banging their arms, slapping the bus like they’re trying to get the it moving again. “Hey, Mario, catch!” Nico says. He tosses me his new soccer ball. Papá just gave it to him for his fifth birthday. Nico doesn’t go anywhere without it. He even sleeps with that ball! We play catch in the back seat. Señor Perez is thirsty? Uh-oh. I’m getting an idea. A voice pops into my head: Mario, do you really think you should go through with this? I should but I don’t listen. To my better self, Papá would say. The señor eyes the café. It has a torn blue awning. Through the opened door we see people sipping on tall drinks or from little cups of coffee. All around the plaza, the traffic is stalled. Drivers are honking and yelling and waving their arms in the air, but nothing moves. Two government soldiers stand on the corner, their shiny black hats tilted against the setting sun. Nico and I watch as Señor Perez makes his way through the square. At the outdoor market, indígenas from the mountains hang woven blankets and clothing on racks to sell. Farmers set out large baskets overflowing with fruits and vegetables. Braids of onions and garlic drape over one farmer’s shoulders. He walks along the street, calling out, “Cebollas. Ajos. Tengo cebollas. Ajos,” asking people if they want to buy some. Señor Perez goes into the café. That’s when I open my door and nudge Nico. “Vamos,” I say. “But Señor Perez said….” Nico’s eyes are wide. He’s already grabbing his soccer ball and sliding to my side of the car. Nico never worries about my better self. We tumble out of the car while Señor Perez gets his refresco. At last we are freed from Señor Perez’s smoky cage, and Nico wants to play. He throws his black and white soccer ball into the road. We’re standing next to the car, kicking the ball back and forth. “Step back, Nico,” I say. “Get ready for this one!” I tap the ball with the inside of my foot. Nico has kicked the ball too hard and it’s rolling in the gutter down a hill away from the plaza. “Come on. Let’s get it!” I say, chasing after the ball. Nico follows. We run a down a side street. Up ahead is a man staring under the hood of a car. At his feet he’s got a cardboard box stained with grease and filled with tools. He’s scratching his head. I like how he looks like that, bent over and thinking what to do. I fix the picture in my mind to draw later. Finally, I reach the ball and stop it with my foot. I’m catching my breath when Nico charges from behind and kicks it out from under me. “Oh, great, Nico,” I say. It’s a good, strong kick for a five-year-old – too strong and going in the wrong direction. Señor Perez is probably leaving the café right now. Nico’s high kick lands the ball – splash! – in a muddy puddle left by an afternoon shower. It bounces against a man’s legs and rests at his feet. My stomach sinks. Nico’s target is a soldier.